His first mission as Imperial Auditor leads Miles and his colleague Vorthys to Komarr to investigate the partial destruction of the Soletta array, a sort of mirror construction to strengthen the sunlight for terraforming the planet. Much more interesting than the investigation, however, turns out to be his hostess, Vorthys's niece Ekaterin. This is my second complete run through this novel... and admittedly the first one that I found difficult at times. I think most of that is due to the divided point of view between Miles and Ekaterin, the rest comes from the not too complicated plot that clearly takes a backseat here. Ekaterin is married to the administrator of a terraforming business - a man who's ignored his genetic defect for years, and therefore puts their son at risk, which Ekaterin can't abide by. Additionally, there's no love and respect left in their marriage, she feels trapped with little light at the end of the tunnel. I actually liked her point of view in my first reading this novel - her interest in Vorkosigan and his seeming to cope with his defects, the way he apparently doesn't stifle his (past) girlfriends but lets them spread their wings; her horror when she suddenly finds herself in the middle of his investigation. But now I thought this passages dragged on a bit too much. Of course, the whole novel only serves one purpose, which is to introduce Ekaterin as an equal partner for Miles. In the end, though, she comes across as a bit too good a fit: she's quick to look beyond Miles's physical deficiencies (including his seizure condition) because she's used to deal with the fear of genetic imperfection. She's rational, calm in a crisis. She loves Barrayar... and she ends up being available for courtship (which is dealt with in the next novel). 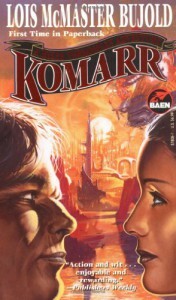 Komarr isn't a bad or boring story. But it lacks the re-readability which I've so enjoyed so far. And granted, I love Miles's point of view, and that half of this novel is taken away with bad marriage-turmoil from "other than Miles" doesn't satisfy me at all. Therefore: Komarr's so far, the weakest part of the series.